Fig. 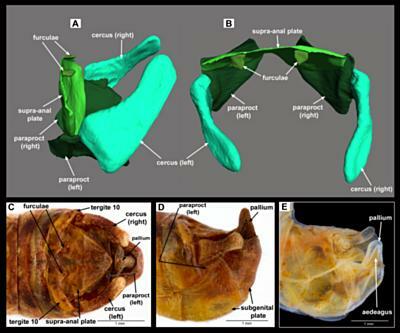 5: 3D reconstructions (in copula positions) and DSLR images of male external genitalic components of Melanoplus rotundipennis: A. 3D, left lateral view, posterior to right; B. 3D, dorsal view, posterior downwards; C. DSLR, dorsal view; D. DSLR, left lateral view; E. DSLR, left lateral view, made translucent with KOH.